Gannon's Just In. 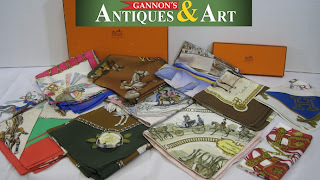 As Southwest Florida's most active Antiques & Art Mall, Gannon's Antiques & Art acquires antiques and art almost daily. Here are some of the newest amazing treasures we just got in. Antiques Mall Vendor featuring a huge assortment of antiques, art, and collectibles in our Fort Myers, Florida antiques mall. As you can see this unique vendor has all kinds of neat vintage and antique treasures. You can see vintage pottery, art glass, furniture, clothes, and more. This is just one of the vendors from Gannon's Antiques & Art. 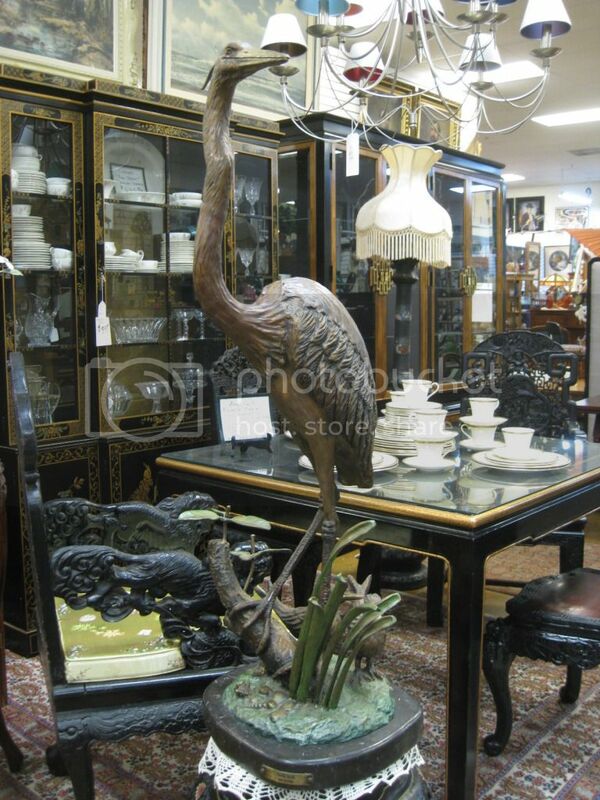 where we also buy antiques and offer free antique appraisals. If you have items we can help you with please contact us. 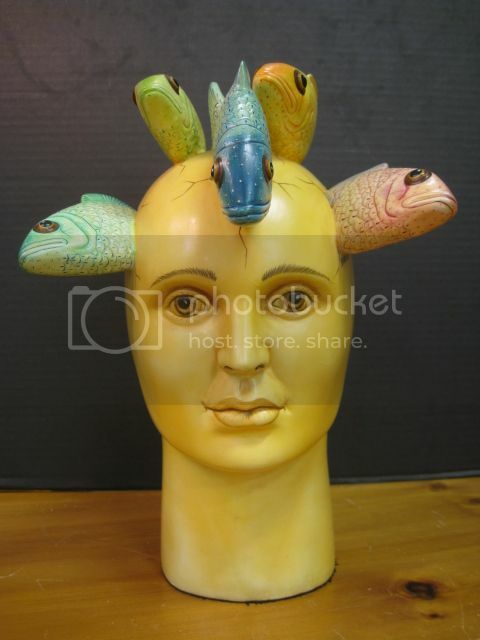 You can also see more of this unique vendor's merchandise on our Antiques Vendor blog post!. Vintage Movie posters from our antiques mall. We put the original movie trailers they were advertising beside them for fun. Carrie (1976) Original Movie PosterClick the poster to enlarge & watch the trailer! Carrie is a 1976 American supernatural horror film based on the 1974 novel of the same name by Stephen King. The film was directed by Brian De Palma and written by Lawrence D. Cohen. The film received two Academy Award nominations, one for Sissy Spacek in the title role and one for Piper Laurie as her abusive mother. The film featured numerous young actors – including Nancy Allen, William Katt, Amy Irving and John Travolta – whose careers were launched, or escalated, by the film. It also relaunched the screen and television career of Laurie, who had not been active in show business since 1961. Click the poster to enlarge & watch the trailer! Dog Day Afternoon (1975) a true story. A man robs a bank to pay for his lover's operation; it turns into a hostage situation and a media circus. Starring Al Pacino, John Cazale, Charles Durning, Chris Sarandon, Penelope Allen, James Broderick, Lance Henriksen, and Carol Kane. 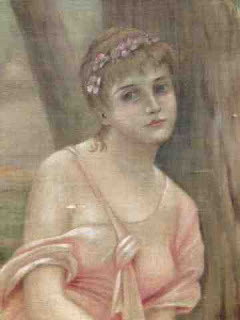 The title refers to the "dog days of summer". The film was inspired by P.F. Kluge's article "The Boys in the Bank", which tells a similar story of the robbery of a Brooklyn bank by John Wojtowicz and Salvatore Naturale on August 22, 1972. This article was published in Life in 1972. The film received critical acclaim upon its September 1975 release by Warner Bros. Pictures, some of which referred to its anti-establishment tone. Dog Day Afternoon was nominated for several Academy Awards and Golden Globe awards, and won one Academy Award. At the Earth's Core is a 1976 fantasy-science fiction film produced by Britain's Amicus Productions. It was directed by Kevin Connor and starred Peter Cushing, Caroline Munro, Philippa Herring and Doug McClure. It was filmed in Technicolor. It was based on the fantasy novel At the Earth's Core, by Edgar Rice Burroughs, the first book of his Pellucidar series, in token of which the film is also known as Edgar Rice Burroughs' At the Earth's Core. The original music score was composed by Mike Vickers. Futureworld where for the right price anything you have ever imagined and more can be yours. A world built to safely satisfy everything you have ever wanted. It has been several years since the disaster at the Delos resort (events of "Westworld"), and Delos is ready to reopen, replacing Westworld with the new "Futureworld," which is getting rave reviews. However, one of Delos's most famous critics, reporter Chuck Browning, is still not convinced that Delos has cleaned up its act, especially after an informant with inside information about Delos is murdered. Chuck teams up with fellow reporter Tracy Ballard and goes to Delos to find out why his source was killed. 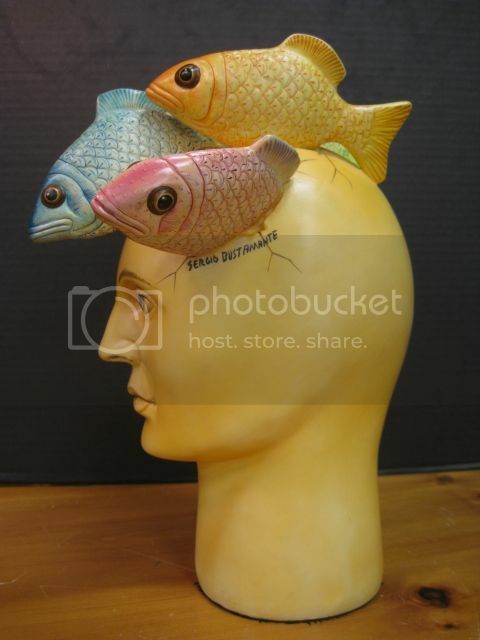 What they discover is beyond any of their imaginations. Starring Peter Fonda, Yull Brynner, Blythe Danner, and Arthur Hill. These are just some of the vintage movie memorabilia from our antiques mall. We also have autographs and other great collectibles. 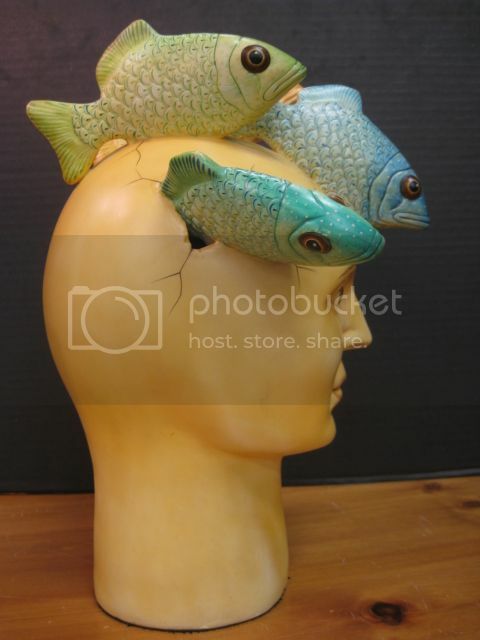 We offer free antiques appraisals and buy vintage collectibles. If we can help you please contact us. You can also see ourVintage Movie Posters blog post!. Louis Vuitton Motoring Trunk just into our antiques mall at Gannon's Antiques & Art. As you can see its in excellent condition. These were found originally on Rolls Royce cars from the 1920's. You can see our video of this amazing piece to the right. You can also see more pictures and an original 1920's Rolls Royce featuring one of these Louis Vuitton Motoring Trunks on our Louis Vuitton Motoring Trunk Blog Post!. We also buy Louis Vuitton pieces and offer free appraisals. See all the Hermes scarves on our Hermes Scarves blog post! This is an exceptional pair of antique wall sconces circa 1801 Empire. They are gilt and patinated bronze featuring an Egyptian emperor bust at the top with three light candelabra in the form of heralding trumpets, each with a face on the curve. The gilt leafy wreaths add to the Impressiveness of these 20 inch tall ormolu wall sconces. They were stored in a box dated 1801 which is correct for the period of these rare Egyptian revival sconces. One half of a laurel wreath is no longer attached at the back. Imagine the magnificent room these wall sconces would have lit! They would be mysterious and elegant flickering in the candlelight. These antique lamps are incredible and unlike any we have had in our antiques mall before. Click here to see our antique Egyptian sconces blog post! 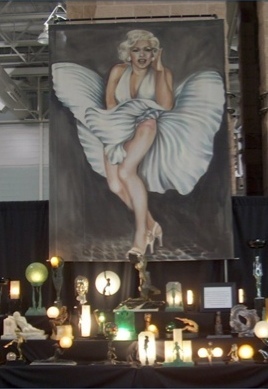 Marilyn Monroe background prop that was used in one of Elton John's 1970s concert tours. It is a large airbrush rendition of Marilyn Monroe for his famous single, "Candle in the Wind". This song may have been the number one single of all time in the United States. He made a second version in 1997 which he sang at Princess Diana's funeral. What a great opportunity to own a backdrop for a song that was written about two such famous women! As you can see from the photos it is very impressive! The previous owner used it as decoration for his high quality art deco booth at the top art and antique shows around the country. Sir Elton John is an icon of the music industry and this Marilyn Monroe backdrop is an iconic image to his song, Candle in the Wind! 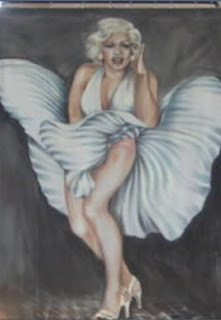 Click here to see our Marilyn Monroe blog post! Beautiful antique French tapestry just into our antiques mall. It features incredible details and remains in great condition. Imagine the gorgeous home this must have once hung in! It measures approximately 3 feet across and 69 inches in length. It came from a local retired resident who said it was his mother's and before her, his grandmother's. 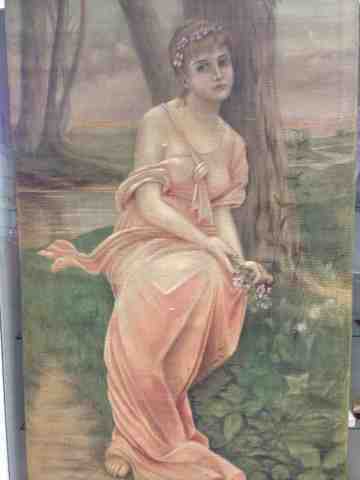 This is classical Art Nouveau style dating from the turn of the last century. A true beauty! Click here to see our antique tapestry blog post! 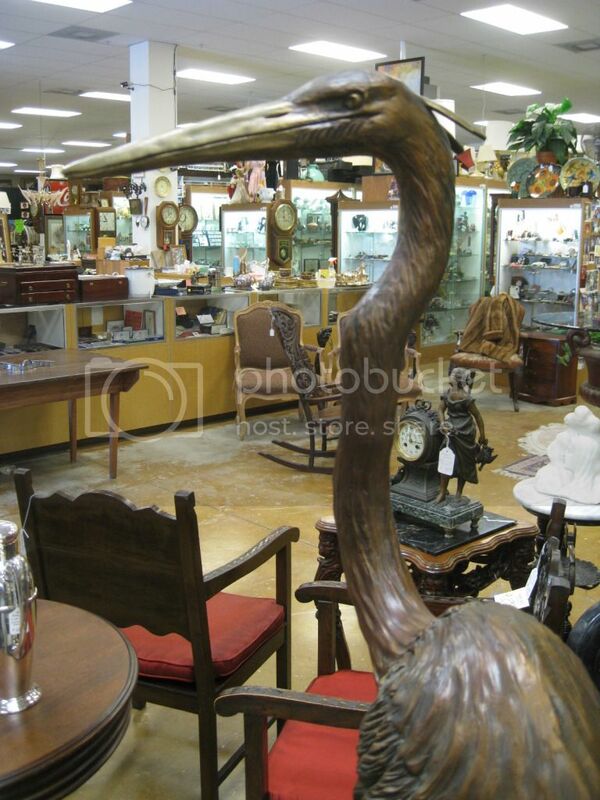 We buy antiques and offer free antiques appraisals. If we can help you with your antiques please contact us! Click the pictures to enlarge the pictures. This is a beautiful antique D.C. Muller & Bro. carousel horse just into our antiques mall. It's a Philadelphia style Second Row Stander with a peek a boo mane on custom stand. As you can see it looks amazing and has been professionally restored by Wolf Studios. This antique carousel horse is about 51" long and is certain to be the highlight of any advanced collection. 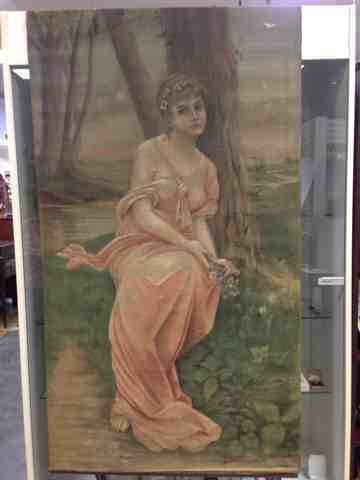 Click here to see our D. C. Muller antique carousel horse blog post! 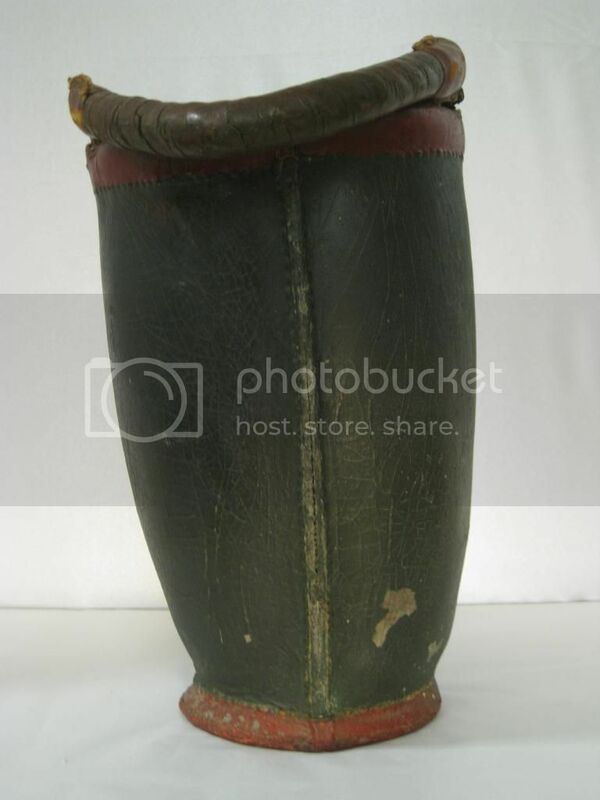 This is a rare antique Persian papier mache pen holder. In classic form with round edges and raised dome top. Every inch has been hand painted with great detail. The top features three unique scenes and there are three larger scenes that wrap around the sides. The interior has been hand painted black and this piece measures about 7" long. Click the images above to inlarge pictures. See it on our blog. We just got in a great collection of vintage china. It is in great condition. Take a look at some of the pieces below. All of the pieces in this vintage china set were well caref for and in great condition. You can see the pieces in more detail on our blog or come see us in person. We also buy vintage china and do complete estate buys. This is a huge bronze sculpture from award winning listed artist Kim Kori. 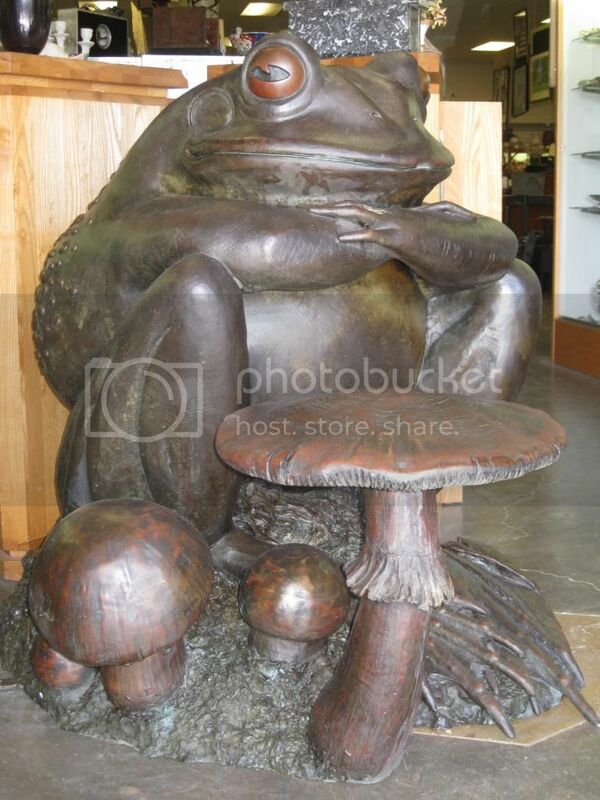 As you can see this bronze statue is extremely large and well detailed. The artist put fine attention into every inch of the gigantic piece. Kim Kori's sculptures combine her love of nature with a touch of magic. It's no wonder why her art is so sought after. 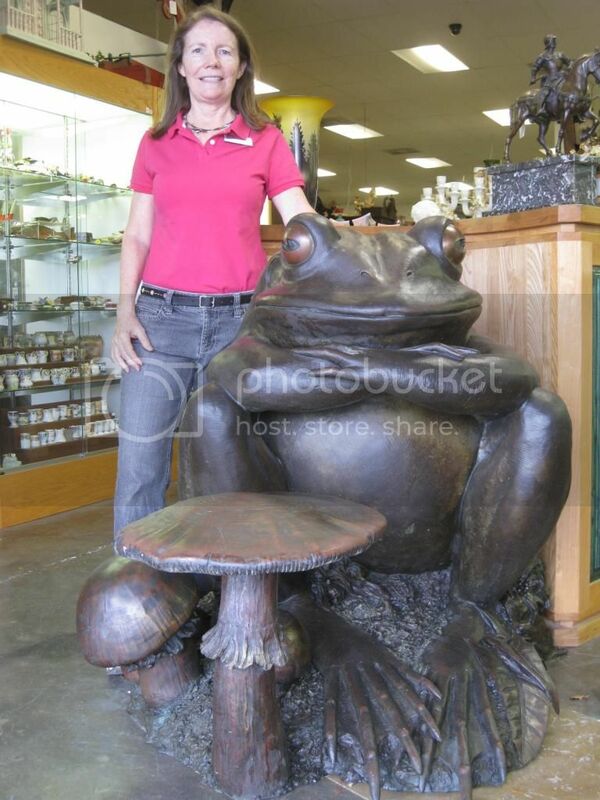 This rare bronze frog is one of her largest pieces ever. 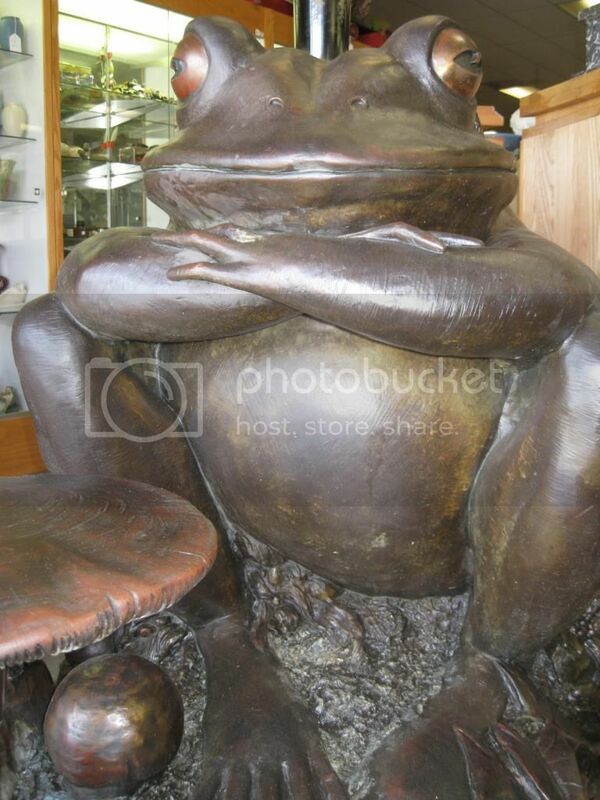 Come see this unique piece of other fine bronze sculptures in our huge antiques mall at Gannon's Antiques & Art. 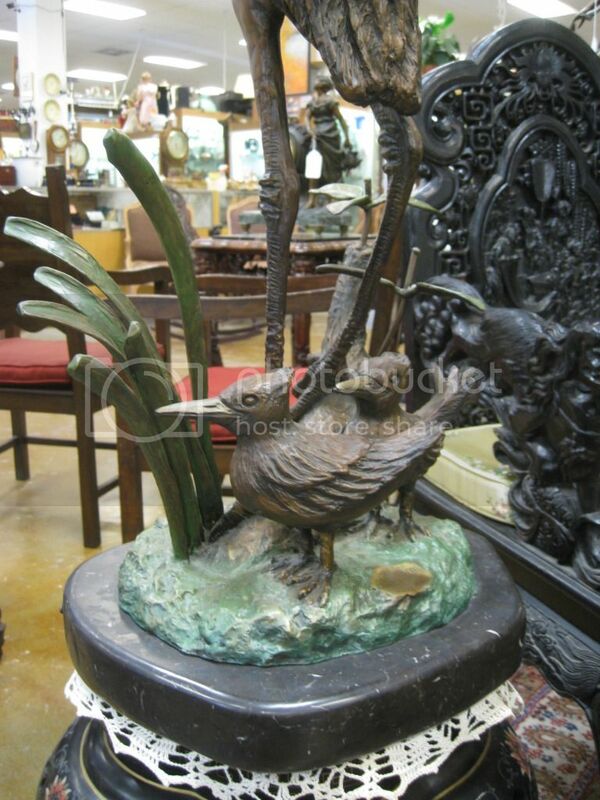 We also buy bronze art and we buy antiques daily. 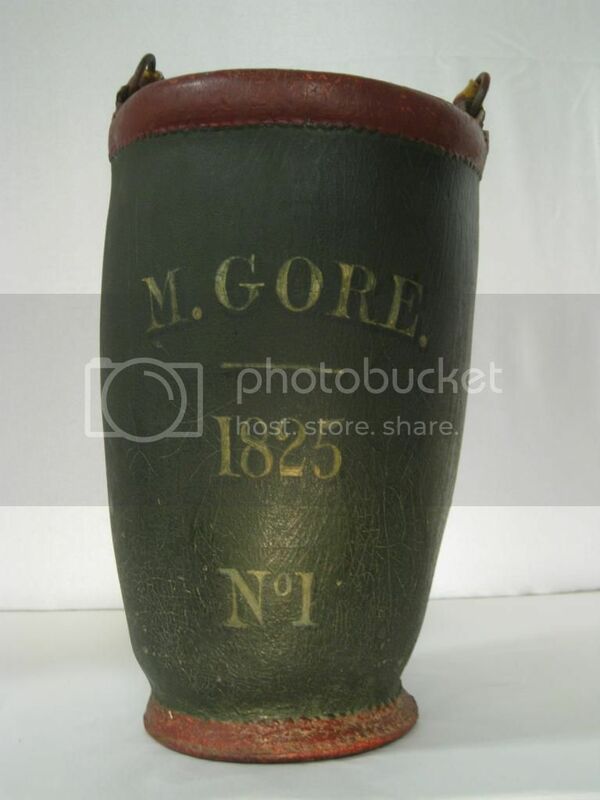 This is a pair of antique fire buckets dated 1825 with the owner's name. These amazing antique fire buckets are a set and we do have the provenance of the family we bought them from dating back to the 1600's when the family first came to Boston. Antique Fire Department Collectibles are very sought after and this pair in their condition are extremely rare. This is a very beautiful limited edition bronze sculpture done by listed artist Carl Wagner. 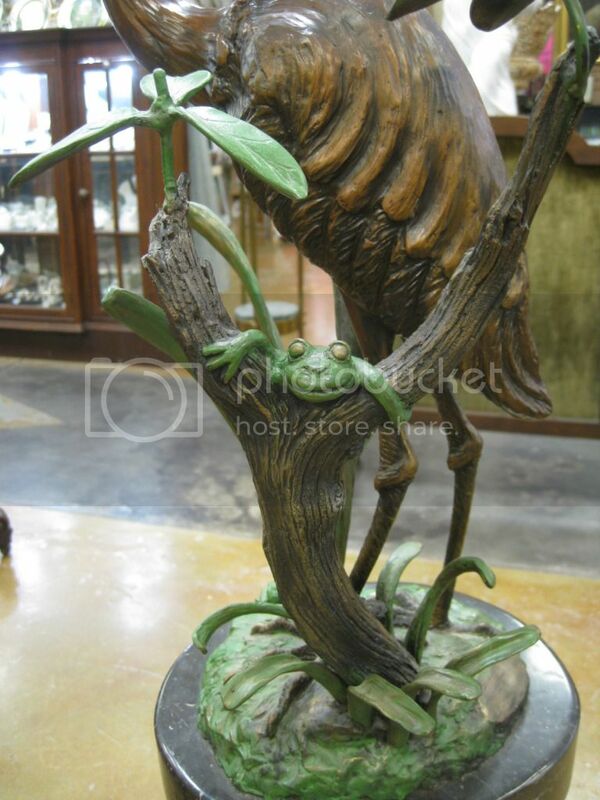 This is a 46" tall blue heron with two terns and foliage named "Sand Bar". It is a limited edition piece numbered 24 of 50 with certificate of authenticity. 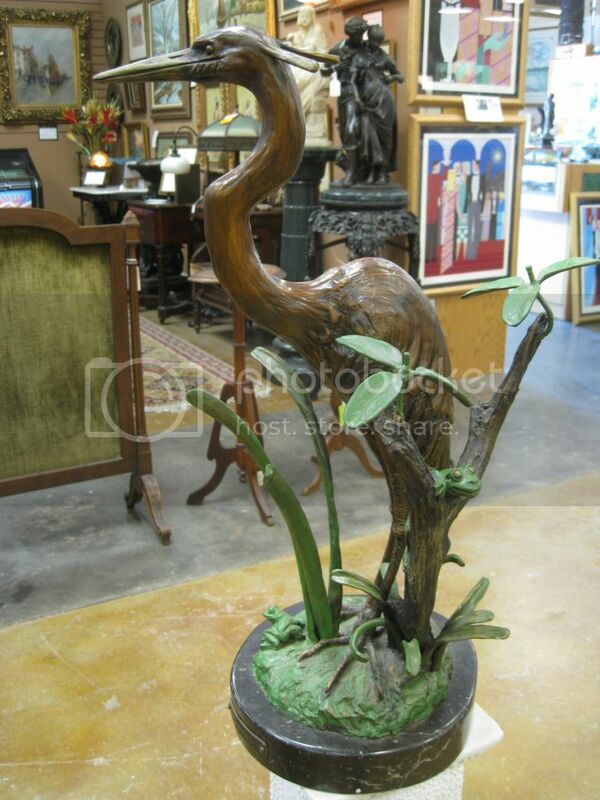 Here's an amazing sculpted depiction of a fabulous South Florida wildlife scene by Carl Wagner. 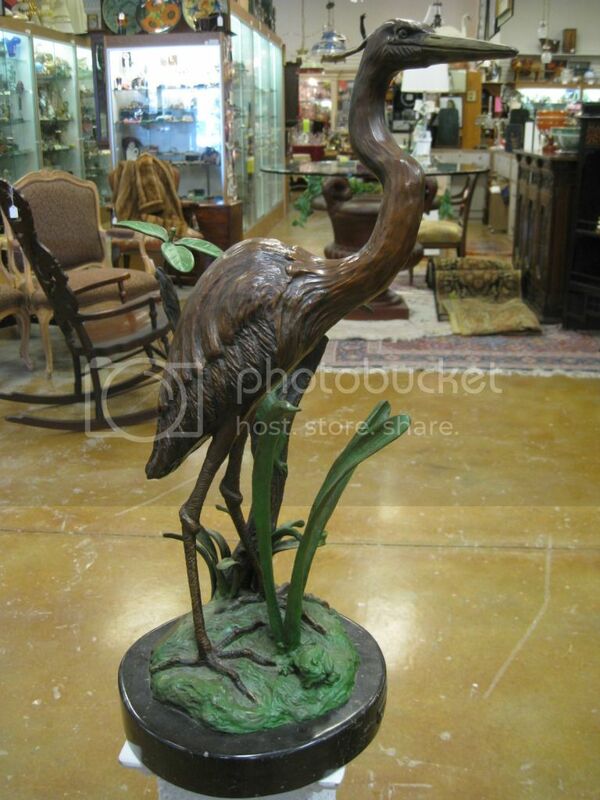 This is a 27" tall blue heron with foliage and adorable frogs named "South Bay". It is a limited edition piece numbered 12 of 50 with certificate of authenticity. Very nice sculpture by Sergio Bustamante just into our antiques mall. 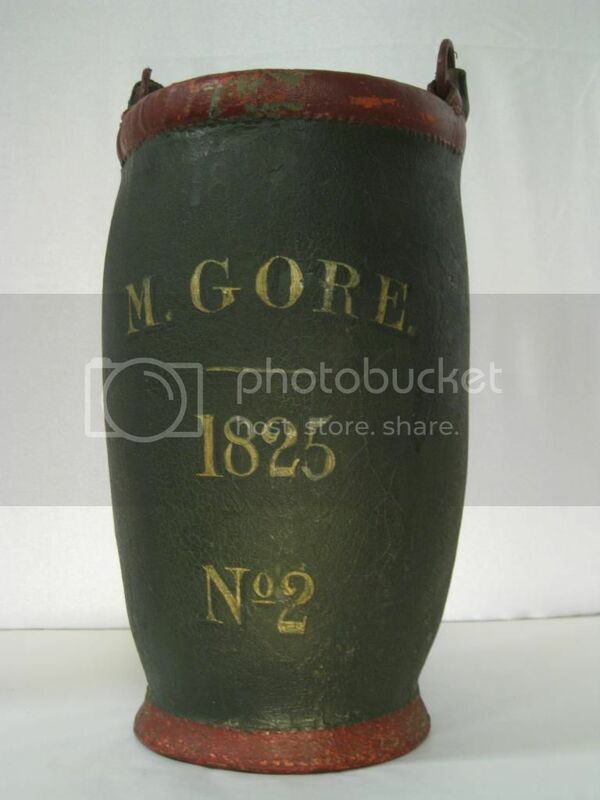 It stands about 13" tall and is truly a unique piece we are thrilled to have on display at Gannon's Antiques & Art.